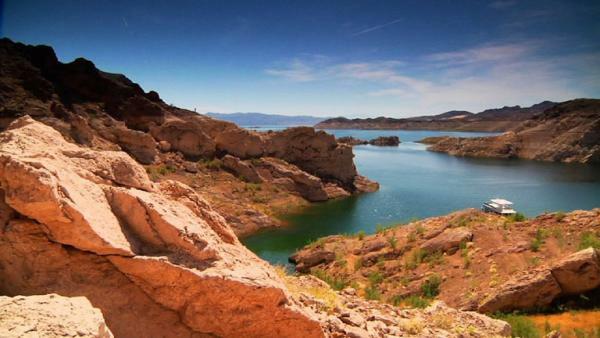 The bright lights and night life of Las Vegas draws millions of visitors to Nevada every year but just outside of Sin City you'll truly find God's country in America's largest man-made lake, Lake Mead. Greg shows you how to explore this pristine lake with the help of a large, houseboat base camp and a smaller, faster boat to access the rugged shores of this enormous reservoir. Motion teams up with Forever Resorts and hits Lake Mead on one their amazing, fully-loaded houseboats. Greg and the crew use this boat as a floating base-camp to launch their Lake Mead adventures. After a great shoreline hike, the Mojave Desert's high temps lead to a little cooling off session in Lake Mead. Greg puts the GoPros to work and shows you how to have fun above and below the surface. With hundreds of miles of raw shoreline, Lake Mead is the perfect place to jump off the boat and explore this wild, desert beauty. Take a look inside the amazing houseboats for rent on Lake Mead to make your adventure one to remember.